This summer (2018), the Forum helped organise, co-ordinate and promote the city’s second Festival of Sport. The first Game on Derby event in 2014 was an initiative from the Sport Forum and held in co-operation with the city council, supported by local clubs. It was a 25-day festival to coincide with and celebrate the Commonwealth Games in Glasgow. This enabled people to celebrate sport in Derby and for clubs to show off their facilities. Local swimming star Adam Peaty was among competitors from Derby taking part in the Games who helped publicise Game On Derby. The event was formally launched at the school athletics games held at Moorways Stadium. The idea was for local cubs to open their facilities and give people a chance to try a new sport or re-connect with one that they had not been involved with for some time, both to enjoy the experience and follow it up at a club but also to encourage a healthy lifestyle. The second event this year was time to coincide with the FIFA World Cup in Russia and hoped to encourage people to get off couches and to try their hand or feet at different sports and so encourage healthier lifestyles. 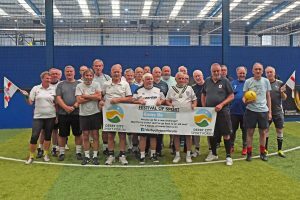 It was launched by the Deputy Mayor of Derby, Councillor Frank Harwood, at a walking football event run by Derby County Community Trust at Powerleague on Pride Park for over 50s and over 65s. 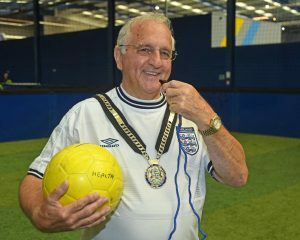 “You dedicated footballers, here, prove that age is no barrier to competing in sport and having good exercise. You are an excellent example for others to follow,” he said. 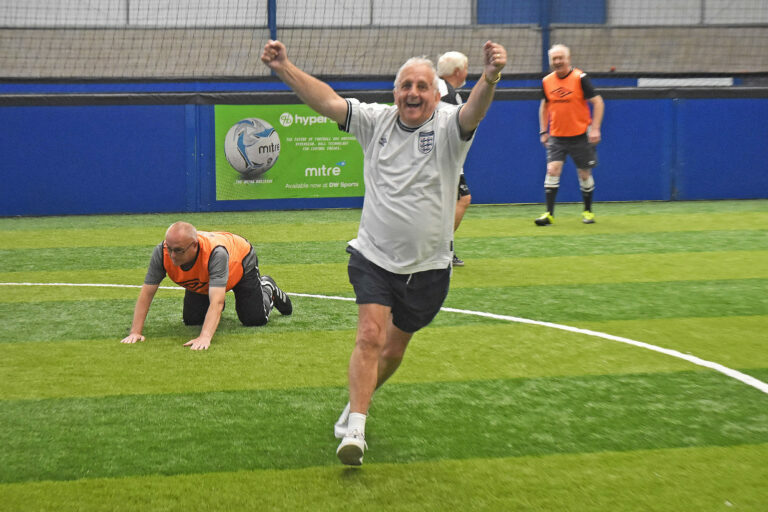 Dressed in an England shirt to encourage the national team Councillor Harwood joined in and even scored for the over 65s in their 6-2 victory– a great achievement for an 81-year-old! 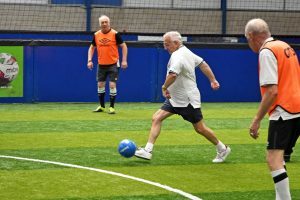 Sports on offer included archery, table tennis, badminton, non-contact boxing, karate, running, trails swimming for youngsters, cycling for people with disabilities, fitness training at the University, fencing, plus sports for the over 50s at Springwood Leisure Centre, Oakwood, and netball and walking football at Willows. # The main picture on the front page of the website shows disabled Army veteran Andy Carlton(right), who joined Shelton Striders running club on a three kilometre run through Darley Park as part of the Festival of Sport. 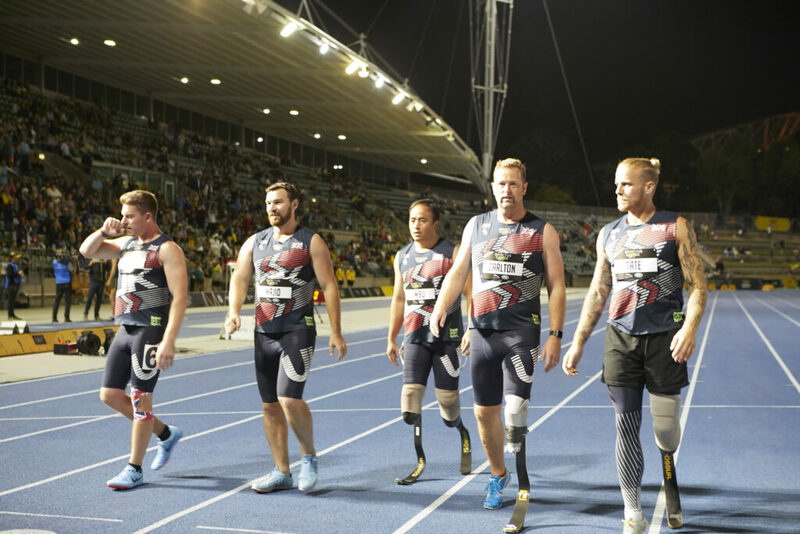 Andy, from Swadlincote, was the only person from Derbyshire in the 72-strong team to represent the UK in the Invictus Games in Sydney, Australia, in October. A staff sergeant with the Queen’s Royal Lancers until he was medically discharged in 2013, Andy was serving in Afghanistan when he was injured by an improvised explosive device which left him with multiple injuries including the loss of his left leg. He found that sport, including Taekwando and running had given him a new purpose in life and he joined in the Darley Park run as practice for the Games, putting inn an impressive performance. Thanks to Andy and his Help the Heroes colleague for taking part and to Shelton Striders for making them so welcome.